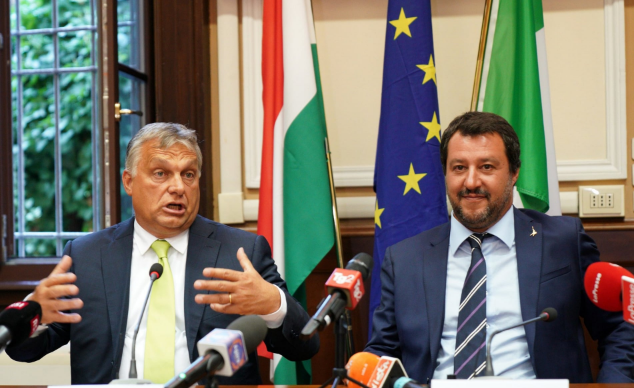 European leaders in Brussels must have cowered in fear as they saw the meeting between Hungarian Prime Minister Viktor Orban and Italian Interior Minister Matteo Salvini unfold in Milan, Italy yesterday. The two rightwing leaders are united in their anti-immigration policies and relentlessly bashing of the EU. After a two hour meeting behind closed doors, they called for the creation of a pan-European anti-migrant alliance that would seek to prevent any further migration to Europe from besieged regions in Africa and the Middle East and would try and gain the upper hand in the EU Commission. Related coverage: <a href="http://thegoldwater.com/news/35357-France-Macron-Slams-Trump-Orban-and-Salvini-In-Rentr-e-Speech"> France - Macron Slams Trump, Orban and Salvini In ‘Rentrée’ Speech</a>. Meanwhile, Hungarian Prime Minister Viktor Orban hailed his Italian colleague Salvini as his "hero and companion" for seeing turn away migrant rescue ships coming from Libya, claiming that Mr Salvini’s actions were crucial for Europe's security. Mr Orban: "Hungary has proven that migrants can be stopped on land. And this is where Salvini's mission starts: Italy must show that migrants can also be stopped at sea." However, Mr Salvini's coalition partners from the populist Five-star Movement (M5S) reacted angrily to the meeting with Mr Orban. Writing in the La Stampa newspaper, the Italian deputy prime minister and leader of the Five Star Movement, Mr Luigi Di Maio said that Budapest's refugee policy was too harsh: "Orban's Hungary is building barbed wire fences and refusing to redistribute refugees in the EU." Sanity is rare these days.